It was just a matter of time before another tax scam came to surface. Just when you think you know what to listen for, things have changed. The new scam appears all too real! And, it’s spreading quickly. With the most recent scam, the crooks will deposit falsely claimed tax refunds into taxpayers’ own bank accounts. Crooks obtain taxpayers’ information and use it to file a false tax return in those taxpayers’ names. The return uses false information, which claims a tax refund. However, instead of having the refund go to the crooks account, this scam sends the money to the bank accounts of the taxpayers whose information was stolen. Thieves are then using various tactics to reclaim the refund from the taxpayers. Scammer use automatic or robo calls to send a recorded message. It threatens the taxpayer with criminal charges, arrest and “a ‘blacklisting’ of their Social Security” numbers. The recording then provides a phone number for the victim to call to return the erroneous refund. What should you do if you believe you are a victim of this new tax scam? Return the money to the IRS, following the IRS “established procedures” described in Topic Number 161 – Returning an Erroneous Refund – Paper Check or Direct Deposit. What happens when you try to file your actual tax return? Taxpayers who file electronically may find that their tax return will reject because a return bearing their Social Security number is already on file. Then what? Taxpayers should follow the steps outlined in the Taxpayer Guide to Identity Theft. Taxpayers should mail a paper tax return along with Form 14039, Identity Theft Affidavit, stating they were victims of a tax preparer data breach. Filing your tax return early can help prevent you from being targeted. Individuals who become the victim in these scams also may call the IRS at 800-829-1040. Businesses should call 800-829-4933. Bryant & Associates, PC is a full service tax preparation service in Lincoln, NE. 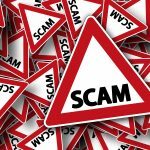 Contact our tax professionals for more information on various tax scams and how you can protect yourself. If you have any additional questions about your taxes or would like us to get started on yours, contact us at (402) 423-0404. Call us today to schedule an appointment! Kim Bryant, CPA at Bryant & Associates, PC has more than 25 years experience in Nebraska and Iowa small business taxes, accounting and financial issues. Kim has spent her career working in all aspects of accounting and business management, from working in two local CPA firms and owning Bryant & Associates, PC since 2001. Kim’s staff of accounting specialists specialize in helping small businesses grow and plan for new opportunities. For more information, call 402.423.0404 or visit the website at www.bryant-associates.com.